Our kitchen section is usually the biggest part of our guide. It brings all the things we love together: technology and food! What better way to start things off than with the Bellini Kitchen Master. When we first saw it, we thought it might have come out of a mad scientist’s lab, everything made perfect sense once we got our hands on it. It does so much (mix, blend, weigh, steam, stir, whip, emulsify, grind, heat, cook, chop and knead), and replaces so many other appliances in the oven. What blew us away with the Bellini, compared to other multi-taskers, is that, it actually did everything we asked it to do quite well! We made a delicious hot soup. We steamed fish, we made whipped cream. Then, when we were done, we popped some warm water and soap in the it and it pretty much cleaned itself. You still have to rinse it and give it a quick wipe, but I’ll take that over a an hour of doing dishes any night of the week! THe Bellini is perfect for people who love to cook and want to get the most bang out of their buck when it comes to the amount of devices that they’ve got on the counter. While Cedarlane’s Spherificator isn’t a multi-tasker like the Bellini, the one thing it does, it does amazingly well. Basically, it can turn any liquid into caviar. Don’t confuse this with Boba. This is way better than that. With Boba, you feel like you are getting wet jelly beans, but with the Spherificator, you are getting these little pearls that burst in your mouth with whatever refreshing liquid you could want! The “caviar” can then go into a beverage, be added to existing food or even just eaten plain. We tried everything from making citrus caviar that we added into tequila, to a hot sauce caviar that we swirled into bloody Mary’s, and even a cranberry sauce caviar that we served for fun at Thanksgiving dinner. The Spherificator is great for anyone who loves molecular gastronomy or even just loves playing in the kitchen. It’s also a great gift for someone who entertains a lot. The caviar can be whipped up on the spot as your guests watch and it’s a complete showstopper event. Unless you’ve had your internet unplugged for the last year, you’ve probably heard of the Sushezi, or as some people call it, the sushi bazooka. 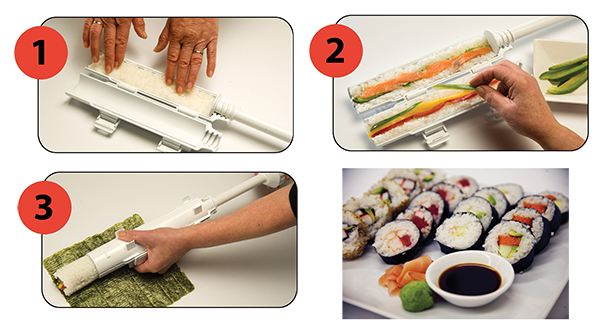 As a lover of sushi, and the worst sushi roller ever, I had to try this out and find out if it really did make sushi making a snap. It really did. My only concern now is that sushi is going to become too easy to make. I’m going to be less inclined to go out and get it from my local sushi restaurant and the chefs aren’t going to be able to send their kids to college! It’s easy, and it’s fun! It’s so fun, that we’d suggest this as a great little host gift this year. If you’ve got a friend who is throwing a party and they like sushi, this is the kind of thing that lets everyone quickly make their own rolls as cleanly as if they’d had lessons! We can’t If you know someone who loves sushi or even just loves to entertain, you need to grab one of these right now! Induction cooking has changed the way I prepare meals. The only problem I’ve had up to this point is that the cooktops have all been so small they it makes it harder to cook anything more than a couple eggs. 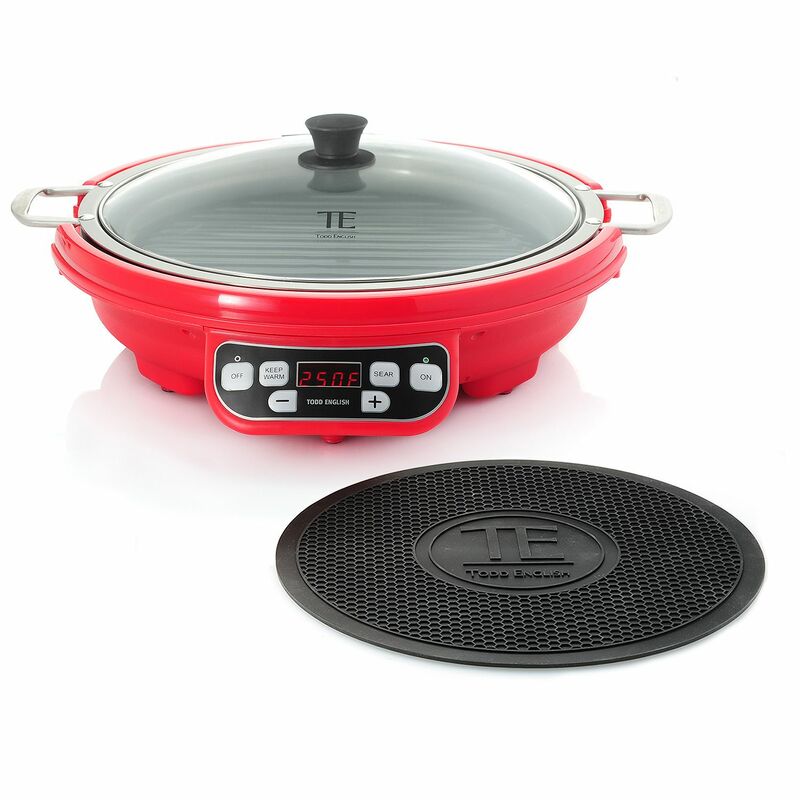 Todd English’s new Induction cooking station changes that. It accommodates up to a 14” pan. That’s a ton of food. If you aren’t familiar with induction, it’s a safer, faster take on the stove that uses magnets to generate heat instead of traditional heating coils. The burner itself doesn’t generate heat, it’s the magnetic reaction between the unit and the pan that heats the pan up. Science is freaking awesome! The result is faster cooking food, quicker boiling water, even heating temps you can control instead of the up and down cycle of traditional stoves. It is no wonder so many professionals are moving towards induction. That’s just the unit. This thing comes with a monster 14” ceramic non-stick grill pan too. It’s winter, but you can still cook burgers for the whole family on this thing, and then you can plop the grill pan down on the table safely because they include a 14” trivet. I’ve never even seen one of these things before. Todd English has helped designed what might be the best induction cooker for consumers on the market, and he’s done it at an amazing value. If you can buy this and actually pry it out of your own hands, it makes a truly wonderful gift. 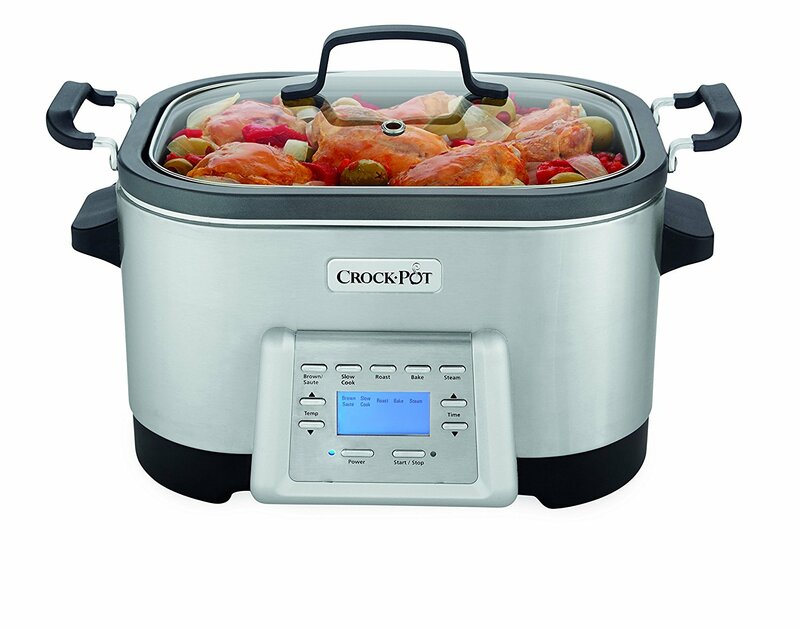 Every year, Crock-Pot comes out with a new innovation. In past years, we’ve even seen them come out with one that you could control from the web, but turning their classic appliance into a a multi-cooker was a stroke of brilliance. Our big test for the Crock-Pot 5-in-1 Multi-Cooker was beef short ribs. Even with a crock-pot, this is the kind of thing that had always required multiple pans and more difficulty than a lot of people are used to. Not anymore. It was so simple! We hit the button to brown the meat and were able to brown all the ribs. We took them out and changed the setting to saute, and we quickly took care of the onions. We added the ribs back in with some beer and some stock, and changed the setting to the slow cooker. 8 hours later, the ribs were done, but we weren’t home, so the machine automatically switched over to warming mode. It was one of the best slow cooker experiences we’ve ever had. What makes this even better, is that traditional crock pots have a heavy, ceramic cooking vessel. They are always hard to grip and too heavy for some people to feel comfortable with. The Multi-cooker has a durable, metal cooking vessel that weighs a fraction of the old style, but it still turned out an amazing flavor. This is a great gift for anyone who loves to cook or eat food. In a list that is dominated by technology, it’s important to remember your roots. 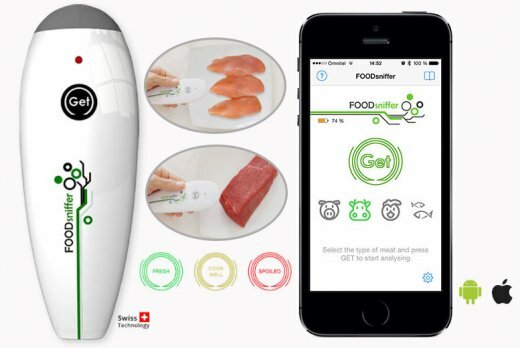 Food processors are great, but the tech can emotionally disconnect you from the food. We didn’t even realize this until we tried the food mill for ourselves. We tried two main tests on the food mill and were blown away on both. First, we made some pureed carrots to use as baby food. After that, we switched to a coarser blade and made ourselves some mashed potatoes. In both instances, there was a visceral feeling that came with the experience. It wasn’t just push a button and forget. You could feel your connection to the food as you turned the crank (and it was very easy to turn). The end result didn’t take much longer, but it was exponentially more satisfying. On the potatoes, it was really great. It was easier than using a traditional masher, and you don’t run risk of getting a texture like wallpaper paste, like when you put them in a mixer. 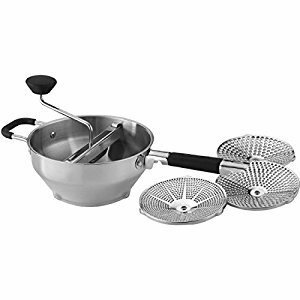 This is a great gift for the thoughtful chef in your life, and anyone who wants to feel more a part of the cooking process. The term life saver is used pretty loosely these days, but we think it really applies to the Food Sniffer. In conjunction with the Food Sniffer app, you hold the device up to a piece of meat, and it measures the gases coming off of it to determine freshness. If it comes back green, you are fresh, yellow and it means you need to cook it well, and red means throw it out. Chances are you have or at least you know someone who has suffered from food poisoning. THat really makes this the perfect gift for anyone. If you ever cook meat, you need this, not just as a gift, but also for yourself! If you’ve ever had a friend or relative that turns into a a three year old when when two types of food touch, this might be the best gift you could ever get them. The great news here is that, as silly as a pan with 3-5 sections really is, the Master Pan is really a good pan in it’s own right. It’s made of cast aluminium, which let’s it heat quickly and evenly, despite the extreme real estate distribution on the pan. Also, the indentations for things like eggs and pancakes help guide you towards making a much prettier end product. 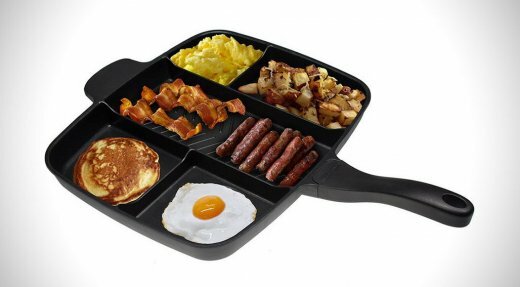 We love this pan. We feel a little silly when we use it, but we love it.